Frankie Cosmos introduced San Diego to the dazzling sensitivity of the eccentric Greta Kline, guiding listeners through the world in her image. 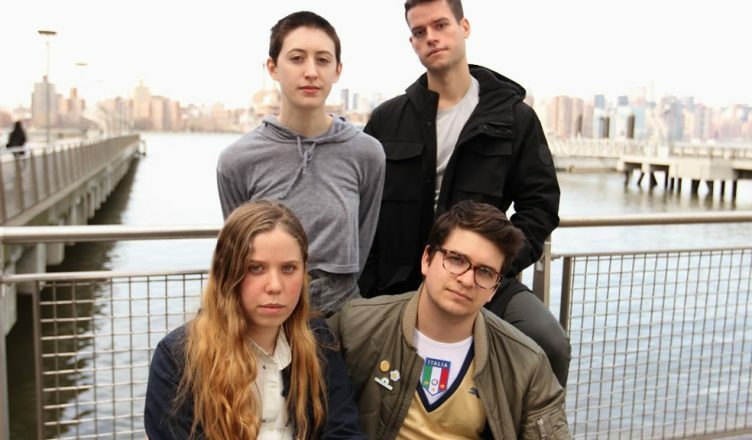 On April 10, Queen Bee’s Art and Cultural Center welcomed Frankie Cosmos to San Diego. Teens and twenty-somethings sporting dirty white sneakers, miniature backpacks, and baby bangs packed the standing-room-only venue, surrounded by a glow of twinkling purple lights. Cosmos had two openers: Lomelda and Ian Sweet. Lomelda’s musical and personal styles were reminiscent of the charmingly introverted Greta Kline (lead singer-songwriter of Frankie Cosmos), and supplemented by expansive vocals with impressive range. Ian Sweet, comprised of a lead guitarist, a bass player, and a drums player, was a lively display of angst. Blaring guitars and squeaking vocals energized the crowd before the band stepped back to welcome Frankie Cosmos. With minimal introduction, Frankie Cosmos opened with “Caramelize,” the first track off their new album, “Vessel.” The song expresses a yearning for connection and the difficulties of obtaining it. Kline’s silky, soft vocals complement her music, both oozing a quiet tenderness without ever verging on the saccharine or syrupy. The band followed with “Apathy,” and proceeded to perform the new album in a linear fashion, broken up with intermittent hits off their previous albums. Cosmos’s audience mirrored the band’s character: Save for a smattering of hoots and hollers, the crowd maintained a calm, laid-back, and, in Kline’s words, “chill,” temperament. Kline also thanked Queen Bee’s Art and Cultural Center for housing the performance, announcing, “I love bees. I think everything is a [f——] bee,” to shouts of approval from the audience. The band’s songs flowed into one another smoothly, united by similar tempos and sounds, and a general brevity. Kline’s performance exhibited a relaxed spontaneity, injecting somber sentiments with an endearing note of levity. During “Same Thing,” Kline closed her eyes to the gentle strumming of her guitar before turning her back to the audience and crouching on the ground to welcome the song’s instrumental break. In “Accomodate,” Kline crooned, “My body is a burden,” looking out to the audience with an expression of simultaneous wonderment and sorrow. Frankie Cosmos is an emblem of fragility. The delicate vocals, deliberately elementary instrumentation, and childlike clothing are all ingredients in Kline’s little-person-in-a-big-world persona. Her lyrical quirkiness and melodic simplicity allow the heart of her music to come to the surface, capturing that elusive poetic clarity that her fellow literarily inclined singer-songwriters aspire toward. This lens of sensitivity frames everything from the perspective of youthful plain-spokenness to create the poignant –– if a little contrived –– identity of the guileless narrator, perennially coming of age. Kline’s hyper-aware inward glance details the experiences of adolescence and beyond through a potent composition of micro-observations. A highlight of the concert was a performance of the intensely catchy “Being Alive,” previously released as a single. At one point, Kline sings, “Collapsing inwardly/ Your name strikes a match in me/ After a drum solo I looked up/ Craig/ Called out to me after/ Said/ ‘Maybe see you later?’” as the drums pick up speed, almost like a heartbeat, before launching back into the chorus. The moment perfectly captures the euphoria inherent in exchanges of sweetness and the magnitude of singular moments. At the end of the song, each band member took turns performing an iteration of the chorus, “Being alive/ Matters quite a bit/ Even when you feel like [s—],” as if sharing the weight of their burden. Marked by sudden oscillations between fast-paced, percussive segments and placid, slow-motion interludes, the band’s musical style straddles the realms of indie-rock, indie-pop, and punk. Cosmos’s deceptively sunny melodies often cloak melancholic and weighty subject matter like unrequited love, self-destructiveness, self-love, and friendship. This paradoxical artistic approach embodies the complicated and often contradictory nature of the music’s material and it seemed to encourage enthusiastic bouncing and bopping in the audience throughout the concert. After the final song, Kline bid farewell to the audience, and the band left the stage. A crowd hung around in anticipation of an encore, but began to file out as the band members started packing up their instruments. Perhaps this lack of a precious sort of conclusion to the evening was fitting. Kline’s prolificacy has proven itself over the years, as has her penchant for minimalism. Listeners can count on a new musical chapter, introduced as suddenly as this one closed.